The 66-years-old veteran comedienne died on Thursday night, confirmed by her sister actress Nova Villa at the Philippine Heart Center in Quezon City. 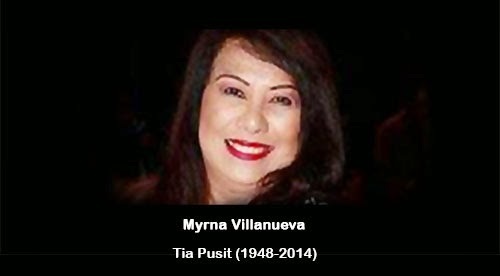 Myrna Villanueva a.k.a Tia Pusit was underwent a double bypass surgery. According to ABS-CBN News, the veteran comedienne was passed away at 11:30 p.m. at the Philippine Heart Center in Quezon City, nearly a month after she underwent double bypass surgery. It added that veteran actress Nova Villa told them that Tia Pusit endured a host of medical complications, including brain hemorrhage, since her operation last September 9. Celebrity friends of Tia Pusit decided to continue the benefit concert for her funeral services and financial assistance for Tia Pusit Family. Inday Garutay told to press that the show will be push through at comedy bar Zirkoh in Quezon City. For those who want to visit the wake of Tia Pusit, Nova Villa said that the funeral engagement for the comedienne are still being finalized by their family. Tia Pusit latest project was on "Ikaw Lamang" as Kim Chiu's nanny and confidante. Comments or suggestions about "Veteran Comedienne "Tia Pusit" died at 66-years-old" is important to us, you may share it by using the comment box below.